Dr. William "Ed" Kois outside his home in Newburyport, Mass. Kois believes many of his patients at the VA Hospital in Manchester, N.H., have received substandard care that has left many of them disabled. Hours after this Spotlight report was published, the federal government removed two top officials at the Manchester VA Medical Center and ordered a “top-to-bottom” review of the hospital. One operating room has been abandoned since last October because exterminators couldn’t get rid of the flies. Doctors had to cancel surgeries in another OR last month after they discovered what appeared to be rust or blood on two sets of surgical instruments that were supposedly sterile. Thousands of patients, including some with life-threatening conditions, struggle to get any care at all because the program for setting up appointments with outside specialists has broken down. 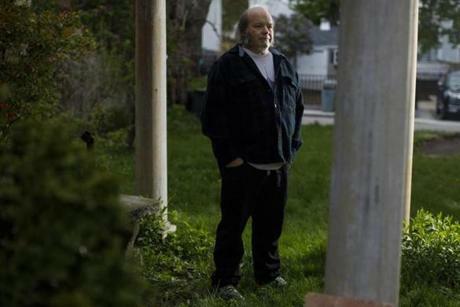 One man still hadn’t gotten an appointment to see an oncologist this spring, more than four weeks after a diagnosis of lung cancer, according to a hospital document obtained by the Globe. And when patients from the Manchester Veterans Affairs Medical Center are referred to outside specialists, those physicians are sometimes dismayed by their condition and medical history. A Boston neurosurgeon lamented that several Manchester patients sent to him had suffered needless spinal damage, including paralysis, because the hospital had not provided proper care for a treatable spine condition called cervical myelopathy. “Only in 3rd World countries is it common to see patients end up as disabled from myelopathy as the ones who have been showing up after referral from you,” wrote Dr. Chima Ohaegbulam , of New England Baptist Hospital, to a doctor at the Manchester VA in 2014. But this hospital, the only one for military veterans in New Hampshire, is just 50 miles from Boston. And it’s supposedly one of the better VA hospitals in the country. Late last year, in fact, the veterans affairs department raised Manchester’s quality rating from three stars to four, putting it in the top third of the entire VA system. Ratings can deceive. Inside the unassuming red-brick walls of the Manchester medical center is ground zero for an extraordinary rebellion led by doctors who say they have almost no say in how the hospital is run, lack tools to do their jobs, and witness chronic shortcomings in patient care. They say the four top administrators, only one of them a doctor, seem more concerned with performance ratings than in properly treating the roughly 25,000 veterans who go to Manchester for outpatient care and day surgery each year. So far, 11 physicians and medical employees — including the hospital’s retiring chief of medicine, former chief of surgery, and former chief of radiology — have contacted a federal whistle-blower agency and the Globe Spotlight Team to say the Manchester VA is endangering patients. The US Office of the Special Counsel, the whistle-blower agency, has already found a “substantial likelihood” of legal violations, gross mismanagement, abuse of authority, and a danger to public health, according to a January letter to one of the doctors who alleged wrongdoing. On Thursday night, a spokesman for Veterans Affairs Secretary David J. Shulkin expressed concerns about the problems relayed by the Spotlight Team. “These are serious allegations, and while we cannot comment on the specifics due to patient privacy issues, rest assured that we will look into them right away,” said the VA press secretary in Washington, D.C., Curt Cashour. Remarkably, leaders of the Manchester VA have confirmed many of the problems, from the fly-infested operating room — “an episodic issue,” said one administrator — to thousands of patients waiting indefinitely for specialist care, which the leaders blamed on the private company hired by the federal government to set up veterans’ appointments outside the hospital. A fly zapper in a now-closed operating room (left) at the VA hospital. At right, faint spotting of either blood or rust can be seen on surgical instruments at the hospital that had not been properly sterilized. In a recent hourlong interview with the Globe, hospital director Danielle Ocker and her chief of staff, Dr. James Schlosser, also acknowledged significant cuts in services, such as the elimination of cataract surgery, as well as administrative glitches that further limited care. For example: The hospital ordered a $1 million nuclear medicine camera in 2015 to replace a balky one, but never installed it because it was too big for the examination room. Without a reliable camera, the hospital in February stopped offering nuclear stress tests for heart disease risk, and bone scans that can detect tumors. The building is expected to be remodeled for a new camera in 2018. 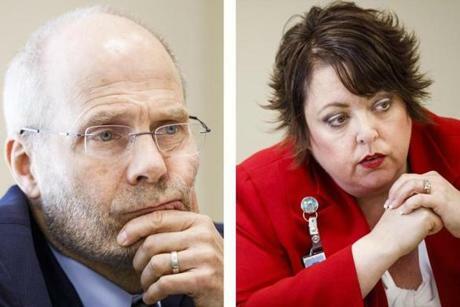 But Ocker and Schlosser expressed surprise that so many members of the medical staff have reported the hospital’s problems to federal investigators. They said the hospital is addressing shortcomings and that patient safety has not been compromised. Ocker, a nurse, contended that Manchester boasts “a zero infection rate” in the operating rooms — a hospital spokeswoman said the unblemished record dates back to 2011 — and shared a veteran’s recent letter praising Manchester VA care. Ocker also said she wanted medical staff to know that she and other leaders take their concerns seriously. “My feeling is that if there are issues that we need to address, or if there are concerns, that we need to hear about them,” she said. In many ways, the Manchester VA is under investigation because doctors became convinced that Ocker and other leaders were not listening. A number of problems date back years before Ocker arrived in 2015, and often reflected lapses in care that occurred when Manchester referred veterans to other VA hospitals or when multiple hospitals failed to coordinate follow-up treatment. But they are coming to the forefront now, in large measure, because one outspoken doctor went public about many patients that he believed had gotten subpar care. Patients like Robert McWhinnie. 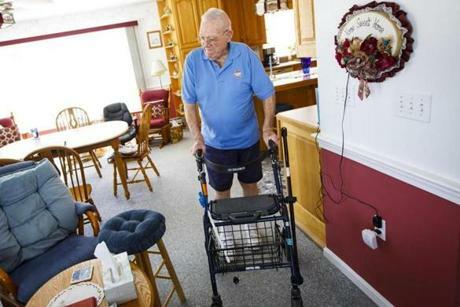 Robert C. McWhinnie pushes his walker through his home in Gilmanton, N.H. The 85-year-old Korean War veteran has an inoperable tumor around his upper spine, limiting his mobility. For 21 years, the tumor’s growth went undetected despite many visits to the VA hospital in Manchester, his lawyer says. McWhinnie, a Korean War veteran who lives in the small New Hampshire town of Gilmanton, relied mainly on a wheelchair to get around when he first visited Dr. William “Ed” Kois, head of Manchester VA’s spinal cord clinic, in July 2016. McWhinnie, who was 84 at the time, had long been a vigorous man who built much of the furniture in his house from maple trees on his land. But then his legs and arms grew weak, he had difficulty talking, and he became incontinent. Kois immediately got alarmed when reading McWhinnie’s medical records. 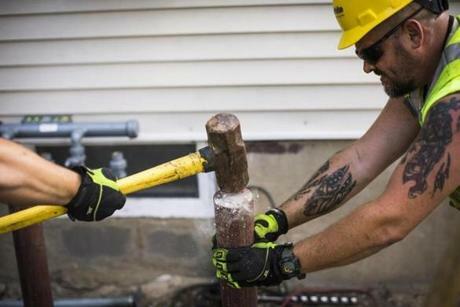 They showed that the retired telephone cable splicer had undergone two surgeries at the VA hospital in Jamaica Plain to remove a tumor from his spine in 1995 but that the surgeon could not remove all of it, according to a copy of the records that his family shared with the Globe. Over the next 21 years, McWhinnie went to the Manchester VA dozens of times for treatment of a variety of ailments. But no one had done imaging to find out if the tumor was growing again, even though regular monitoring was the standard of care after surgery on this type of tumor, according to his lawyer, Mark Abramson. At least as far back as 2007, McWhinnie was gradually losing the ability to walk, the records indicate, something that could have been caused by a tumor pressing on his spine. Kois “took one look at Bob, and he said, ‘Oh, my God, this is a disgrace. This man should have been taken care of,’ ” recalled McWhinnie’s wife of 63 years, Janice McWhinnie. So Kois ordered an MRI and an X-ray and, sure enough, the tumor was choking McWhinnie’s upper, or cervical, spine. It had also grown too big to remove. 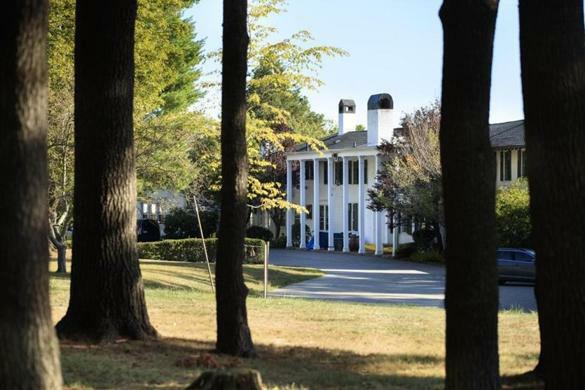 “They ignored him basically for 20 years and allowed this thing to grow and grow and grow,” said Abramson, who recently wrote the VA in Manchester and in Boston that his client intends to sue for negligence. Hospital officials declined to comment, citing potential litigation. Janice McWhinnie holds her husband Robert's hand in their home. The family plans to sue the hospital for negligence. For Kois, McWhinnie’s condition was sickeningly familiar. In his five years at the VA, Kois has compiled a list of at least 80 Manchester patients who were suffering from advanced and potentially crippling nerve compression in the neck, or myelopathy. Some, like McWhinnie, had undergone surgery at other VA hospitals and then relied on Manchester for subsequent care. Kois said he complained about the situation to administrators and other doctors. He even organized a September 2015 conference at Manchester, where he told a roomful of doctors and other VA staff that patients were getting substandard spinal care. Ocker herself gave introductory remarks at the conference. Yet, in the interview with the Globe, she said she only became aware of Kois’s concerns more than a year later when she heard that they were part of the federal investigation. She said she left Kois’s conference after welcoming guests and was never briefed on the content of his presentation. “I did not hear that,” she said of Kois’s allegations. Kois found a far more receptive audience the following year at the federal Office of the Special Counsel, which made his contentions about poor care a central part of its inquiry. After finding a “substantial likelihood” of wrongdoing, the office recommended a full-fledged investigation by the Veterans Affairs Office of Medical Inspector, which began in January. Dr. James Schlosser (left), the Manchester VA hospital’s chief of staff, and Danielle Ocker, its director, during interviews there last month. The VA medical care system, which is used by about 6 million military veterans each year, has been stumbling since 2014. News stories reported that the Phoenix VA Health Care System had engaged in an elaborate scheme to hide the fact that sick veterans were waiting months to see a doctor, and that some had died before they could be seen. As similar allegations surfaced at other VA hospitals and tens of thousands of veterans around the country were found to be waiting months for care, Veterans Affairs Secretary Eric K. Shinseki resigned. “I can’t explain the lack of integrity among some of the leaders of our health care facilities,” he said, shortly before stepping down. But Shinseki’s departure did not stop the drumbeat of scandal. Last year, nearly three dozen whistle-blowers charged that the VA hospital in Cincinnati had made budget cuts that forced out experienced surgeons, reduced access to care, and endangered patients’ safety. The head of the VA’s Ohio-based regional network then retired, and the Cincinnati hospital’s chief of staff was suspended and later indicted on criminal charges. Now President Trump’s appointee as VA secretary, Shulkin, is vowing to stabilize the health care system. “We are still in critical condition and require intensive care,” Shulkin said at a May press briefing. Last month, Trump signed a bill into law to make it easier for whistle-blowers to come forward and for employees to be fired for misconduct. “Up until now, we have too often failed to hold a small number of our employees accountable, for not living up to their duties to serve our veterans, and at the same time protecting whistle-blowers from retaliation,’’ Shulkin said. At first glance, the Manchester VA hospital seems an unlikely flashpoint for the continuing VA care crisis. The 67-year-old hospital has faced some controversies, to be sure. In 2015, a federal judge awarded a Navy veteran $21 million because the hospital failed to properly diagnose and treat his stroke. A year later, Manchester was one of dozens of VA hospitals that government investigators found had publicly downplayed patient wait times. But the VA has generally looked favorably on Manchester. The VA gave the New Hampshire hospital four stars out of a possible five when the department rated hospitals in 2016. Manchester was ranked above average for both the overall patient experience as well as job satisfaction for employees. The national VA also ranked Manchester near the top for minimizing the amount of time patients had to wait to see both primary care providers and specialists. A spokeswoman for the VA in Washington, Gina Screen, said Manchester earned its four-star rating. “While there are known breaches to Manchester VA Medical Center’s environmental standards as it relates to cluster flies in one of the surgical suites, all appropriate actions have been taken” to fix the problem, she wrote. Levenson, the chief of medicine, said the VA quality ratings mean little for a hospital like Manchester, which stopped providing inpatient care in 1999 and farms out patients to other VA hospitals and private specialists for an increasing array of treatments. As a result, he said, Manchester’s quality rating is based on more subjective measures, such as patient and employee satisfaction, than on quality of care. And Levenson said many veterans who use the VA system tend to accept whatever care they get, not objecting even when they’re left in the waiting room for hours. Many are reluctant to challenge authority figures and tend to trust their caregivers, Levenson said. In many of the cases of avoidable spinal injury alleged by Kois, the veterans didn’t even realize their reduced mobility or paralysis could have been prevented. High-ranking doctors at the Manchester VA are indignant on their behalf. Levenson, who plans to retire at the end of the month, is one of seven doctors who have given up leadership positions or disclosed plans to leave the hospital so far this year. Several cited frustration with management. Dr. Edward Chibaro stepped down as chief of surgery recently after his plans to create a more robust surgery center were stymied by the hospital’s failure to replace obsolete endoscopic equipment and restore services such as cataract surgery, he said. You won’t get any argument on that from Richard Zuschlag. A 56-year-old veteran of the Army’s 82nd Airborne Division, Zuschlag was one of three patients whose surgeries were canceled on June 8 when two kits of surgical instruments that were supposed to have been sterilized bore what looked like rust or blood stains. Zuschlag needed hernia surgery after missing about five months of work as a laborer, and he has been living in a Nashua homeless shelter where Manchester VA officials found a bed for him. A hospital spokeswoman, Kristin Pressly, said the hospital consulted the manufacturer of its steam sterilizers after the episode and replaced the filters in hopes of solving the problem. But Manchester has struggled to provide sterile surgical equipment for some time. In January 2016, “any one of three” veterans underwent an office procedure in which the instrument kit had been cleaned with bleach but not sterilized by steam, according to a hospital memorandum. “The Medical Center has been unable to identify which of the three Veterans the kit was used on,” said the memo. Hospital officials say the problem has since been resolved by making sure nonsterile surgical kits are kept separate from ones ready for use. Some of the dissenting medical staff members say the hospital compounds such basic failings with questionable personnel moves. O’Brien, contacted by the Globe, referred questions to the hospital administration. Friends of Dr. Ed Kois predicted he would rue the day he gave up his three-decade private practice as a pain and spine specialist in Nashua for the VA hospital in Manchester. Kois is a skilled diagnostician who has, colleagues say, an uncanny knack for figuring out why, say, a patient’s left hand tingles or lower back throbs. And his empathy for his patients is legendary. A colleague recounted how Kois took an elderly patient shopping for a car after her husband had died. “I don’t consider the physician-patient relationship to end at my door,” Kois explained. But Kois, a board-certified physiatrist — a doctor who specializes in rehabilitation and pain management — has little patience for bureaucracy. He unabashedly describes himself as an anarchist, and he looks the part, with baggy clothes, muttonchops, goatee, and ponytail. He has decorated his hospital office with a framed photograph of the boxing gloves worn by his late father, Adam Kois, whose pugilistic skills took him from the mining camps of western Pennsylvania to Penn State. His son appears to have inherited his pugnaciousness and resolve. Kois was stunned when he arrived in Manchester in 2012 and noticed that dozens of veterans who had received outpatient treatment there for years had badly damaged spines. “Boy, they must have been in some terrific combat,” he remembers thinking. Actually, some of them had seen combat, he said, but their condition often had nothing to do with war wounds. It had to do with their medical care. Certainly, that appeared to be true for Jeffrey S. Sweeney. The 39-year-old Army National Guard veteran injured his spine when an improvised explosive device blew up his gun truck in 2011 in Iraq. He underwent spinal fusion surgery at the Boston VA two years later and should have made a full recovery, according to Kois. Jeffrey Sweeney (right) works on a construction site in Manchester. Sweeney, 39, an Army National Guard veteran, injured his spine when an improvised explosive device blew up his truck in Iraq in 2011. 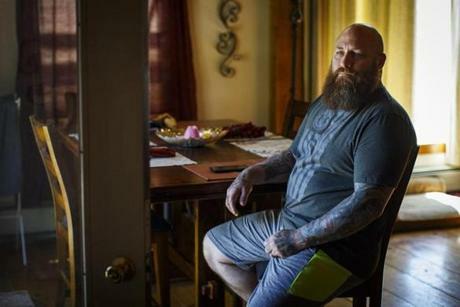 Four months after neurosurgery at the West Roxbury VA in 2013, Sweeney was still suffering disabling back pain and Manchester doctors were increasing his pain medications. It was later discovered that a surgical screw has been inserted into a nerve. A private surgeon removed the screw. But four months after surgery, despite several visits to Boston and Manchester, Sweeney was suffering disabling back and leg pain. It was so severe that at one point, he requested a wheelchair so he could serve as best man at his brother’s wedding. Kois recommended a CT scan, which showed that his VA neurosurgeon in Boston had accidentally penetrated a nerve when inserting a 1¾-inch screw into Sweeney’s vertebra. Neither medical staff in Boston or Manchester had picked up on it, according to Sweeney’s medical records, which the Globe reviewed with his permission. Kois referred Sweeney to Ohaegbulam, the neurosurgeon at New England Baptist, after Manchester’s leadership at the time agreed to pick up the tab. Ohaegbulam removed the screw and redid the operation, relieving much of Sweeney’s pain. Michael St. Cyr’s dilemma was much like Sweeney’s. In 2014, the 21-year Army veteran was suffering excruciating pain at the site of an old neck surgery. Records show that for more than two years, doctors in Manchester did little that helped — until he saw Kois, who ordered new images in 2016. They showed that surgical screws from the earlier operation had come loose: A private surgeon then inserted an artificial disk, which relieved St. Cyr’s pain. Michael St. Cyr, an Afghanistan war veteran, at his home in Campton, N.H. He suffered a broken neck during Army fitness training in 2000, and never fully recovered. For two years, starting in 2014, he visited or called the Manchester VA many times complaining of chronic pain. Finally, new images showed that surgical screws in his neck had come loose. A private surgeon then operated on his neck and relieved the pain. Then there was Galen Warman. An Air National Guard veteran from Concord, N.H., Warman injured his neck when his car was rear-ended in 2007, according to medical records he shared with the Globe. He later developed severe back pain — “I was eating painkillers like Chiclets,” he said — weakness in his arms, tingling in his right hand, and difficulty walking. Warman, who visited the Manchester VA dozens of times after the car accident, had had no MRI of his neck for eight years when Kois first saw him in 2015, according to the medical reports. Kois ordered one, which showed severe spinal cord compression. So Kois sent Warman to Ohaegbulam for surgery, as he had done with Sweeney, with similar results. “It was just a new lease on life,” said Warman, 66, who used to struggle with everyday chores but plans to go hiking this summer. Perhaps most discouraging to Kois, however, was the sheer number of veterans who suffered from advanced cervical myelopathy, a common degenerative spine condition that causes nerve compression in the neck. Left untreated, myelopathy can lead to weakness in the limbs, numbness in the hands, balance problems, incontinence, even paralysis. But, with the advent of magnetic resonance imaging a generation ago, myelopathy became relatively easy to diagnose — and treat with surgery — before it progressed too far. Indeed, Kois said, he had rarely seen an advanced myelopathy case in 20 years. At the Manchester VA, though, Kois saw dozens of them, many being treated not with surgery but with canes, walkers, and wheelchairs to accommodate the patients’ declining mobility. Kois was shocked. “It’s like if you suddenly saw cases of syphilis — a disease that has long been curable with penicillin,” Kois said. “Probably there are places in Appalachia, from which I come, where you might see a group of people like this, but not in New England,’’ Wepsic told the Globe. Kois’s concerns extended beyond spine injuries. He also found that some members of the medical staff overprescribed highly addictive opioids to treat veterans’ pain, including conditions ill-suited for such drugs, such as fibromyalgia, he said. And he alleged that Dr. Muhammad Huq, the former spine clinic director at Manchester, had for years repeatedly copied and pasted patients’ medical histories in computerized records without updating them as conditions changed. Huq had previously been counseled about the practice, which can make it hard, if not impossible, for other medical staff to fully grasp patients’ histories. Huq, who no longer works in Manchester, declined to comment. However, the VA’s Office of Medical Inspector confirmed that an unnamed provider did copy and paste notes, and the hospital took “appropriate action,” according to a memo from Ocker to the staff. Driven by such concerns, Kois organized the conference at the Manchester VA in 2015 that dealt partly with cases of advanced myelopathy. The speakers included Ohaegbulam, who discussed several Manchester patients he had treated, as well as Wepsic, who talked about pain treatment. Kois wanted to sound the alarm about veterans who he believed were being left weakened or paralyzed by substandard care. But his call to arms had, if anything, a negative effect. His ability to care for spinal patients, he says, actually got worse. When Schlosser arrived in Manchester as the new chief of staff in May 2016, Kois said, he clamped down on the doctor’s ability to send advanced myelopathy patients to neurosurgeons at private hospitals in Boston, at Manchester’s expense, for care Kois felt the VA couldn’t or wouldn’t provide. The hospital had a projected deficit of $6 million in 2016, hospital officials confirmed, and Schlosser emphasized to the staff the importance of seeking less expensive treatment within the VA system before resorting to private doctors. Soon after issuing that warning, Schlosser blocked Kois from sending a patient to Ohaegbulam. Kois was angry, and blunt about it. And then there was the business about the flies. A couple of years ago, a veteran lay on his back on a gurney in OR 2 at Manchester as a surgical team prepared him for a knee operation. Staring upward, he asked a startling question. Members of the team looked up, then shook their heads. Not long afterward, the employee who recounted the story — a whistle-blower who asked not to be identified out of fear of possible repercussions — approached a longtime nurse to ask how long flies had been a problem in OR 2. Pressly, the hospital spokeswoman, told the Globe that Manchester has dealt with the fly infestation since at least 2007. The hospital, she says, spent $1.1 million that year to repair masonry, partly to control pests. In addition, the hospital has hired at least two extermination services and spends about $55,000 a year on pest control. Nonetheless, the flies have beaten the exterminators. Last October, Ocker said, the hospital stopped using OR 2, one of four operating rooms in the hospital. A giant fly zapper stood like a sentry in the room in a recent photograph obtained by the Globe. The VA’s medical inspector, in its preliminary findings, said no surgeries have been delayed as a result of the closed OR, Ocker told staff in February. 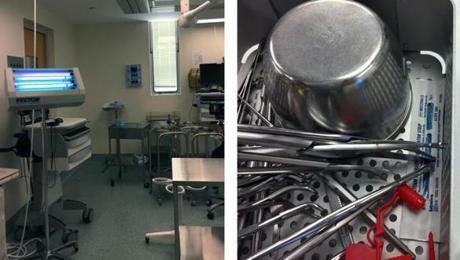 About 400 operations are performed annually at the hospital. For years, problems like the fly infestation were quietly tolerated in Manchester. But something changed over the last couple of years that made key members of the medical staff less willing to accept chronic problems — and more inclined to report them to federal investigators. Part of it, say the whistle-blowers, is that previous leaders of the Manchester VA showed more flexibility when bureaucratic problems arose, allowing Kois, for example, to refer patients to private neurosurgeons outside the VA. In addition, as the Manchester VA cut back on surgery and other services like nuclear medicine, it came to rely more heavily on a new federal program that allows veterans to seek care from private doctors. Veterans Choice, hastily approved by Congress in 2014 to reduce waiting times for veterans’ appointments, came with its own pot of money, so Manchester could take advantage of the program without dipping into its own budget. But the Choice program has a spotty record nationally and has been particularly problematic in Manchester, in part because the hospital has cut its own services so deeply and referred so many patients. Choice, which is administered by Health Net Federal Services, failed to make some 3,100 appointments requested by Manchester veterans in the first five months of this year, according to a VA document obtained by the Globe. That was easily the worst record of the eight VA medical centers in New England and included hundreds of patients who have been waiting more than six months, some with life-threatening conditions. Mark Sughrue, a cardiology nurse practitioner and whistle-blower, has been especially worried about patients with potential heart conditions waiting weeks for nuclear stress tests — which have been referred to providers outside Manchester since nuclear medicine was shut down. 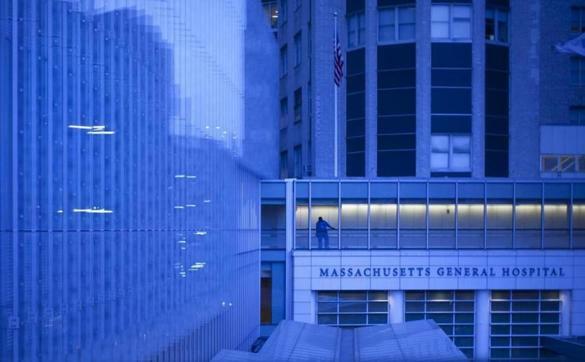 “Eventually there will be a significant adverse outcome,’’ he wrote hospital officials in March in an e-mail obtained by the Globe. “Veterans are getting lost and no one seems to care.” Sughrue declined to comment for this article. Pressly, Manchester’s spokeswoman, blamed the situation on “significant performance issues” with Health Net Federal Services, one of two private companies contracted to administer the Choice program across the nation. In an interview, Dr. Baligh R. Yehia, a VA deputy under secretary, acknowledged that Choice “has a lot of issues and challenges.” The VA has sent several “letters of correction” to Health Net for allegedly failing to follow its contract. In a prepared statement, Health Net officials said they are still trying to adjust to “higher and unexpected volume” of patients using Choice. Beyond the change in Manchester’s leadership and the problems with Choice, there’s a third factor behind the hospital uprising: Kois. His willingness to openly challenge VA leadership and risk his career set an example that several colleagues said emboldened others to speak up as well. “He was a breath of fresh air,” said Levenson. After Schlosser blocked Kois from sending spine patients to private surgeons, Kois contacted a politically connected Manchester lawyer, Andrea Amodeo-Vickery, who agreed to represent the doctors. 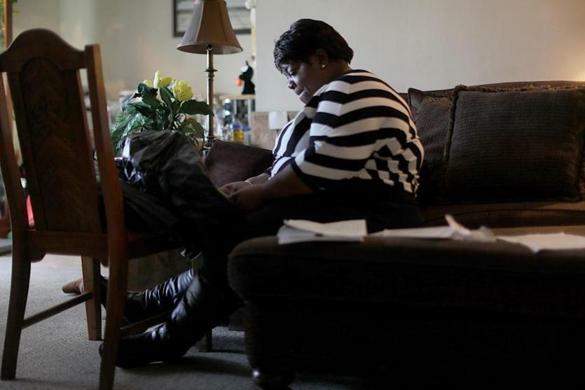 Seven other doctors and three medical staffers eventually followed suit and said they could no longer tolerate problems, from unsanitary ORconditions to long delays in treatment. Dr. Kois says he has compiled a list of at least 80 Manchester patients who were suffering from advanced and potentially crippling nerve compression in the neck, or myelopathy. Several of the doctors met with Shaheen and Kuster and then contacted the whistle-blower agency. In January the whistle-blowers had their first success, as the Office of Special Counsel found “substantial likelihood” of wrongdoing at the hospital and called for the VA’s medical inspector to conduct a full investigation. That happens in less than 10 percent of allegations reported to the Office of Special Counsel, according to a recent report by the office. The VA’s medical inspector was supposed to complete its investigation in 30 days, but has received multiple extensions from the special counsel’s office. Last Thursday, after weeks of back and forth with the Manchester VA over the whistle-blowers’ allegations, Secretary Shulkin’s office joined the discussion. Pressly, the spokeswoman for Manchester, abruptly retracted her office’s answers to some Spotlight Team questions, saying that Shulkin’s office would have a statement instead. Shulkin’s press secretary then announced that VA headquarters would launch an investigation of its own. “Secretary Shulkin has been clear about the importance of accountability and rapidly fixing any and all problems brought to our attention, and we will do so immediately with these allegations,” said the spokesman, Curt Cashour. Meanwhile, whistle-blowers say, conditions in the hospital continue to deteriorate. Dr. Erik Funk, a cardiologist, said the hospital’s cardiology program has been in free fall since officials closed the nuclear medicine program in February. Not only does Funk have to send his patients to other facilities for nuclear cardiac stress tests, he also runs the cardiology program alone. A second full-time cardiologist left several months ago and the hospital hasn’t replaced him, though hospital officials say they are now sharing a second cardiologist with a sister facility. “Since I’ve been here, there’s been a gradual deterioration in the quality of care — not the quality of care I deliver, but the quality of care I’d like to deliver,” Funk told the Globe.